Eating a plant-based diet has opened me up to so many new foods. The amount of variety out there is incredible. I recently raided the whole foods section of my local supermarket and picked up a bunch of random things I'd never cooked before. Feeling pretty creative tonight, I put together this hearty curry. 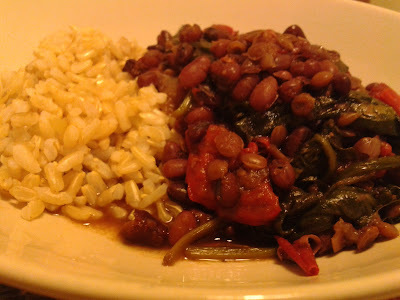 Adzuki beans are punch-in-the-face tasty. The pint-sized, high-fibre legume is also packed full of nutrients such as iron, potassium and zinc. They also have one of the highest amounts of protein among the bean varieties. Boil the beans and lentils in the vegetable stock on a low heat for 45-50 minutes or until soft. Make sure the liquid doesn't dry out, add extra water if needed. Add the red pepper, onions and spinach, season with the curry, thyme, garlic and salt. Cook for a further 20 minutes, adding the olive oil towards the end of the cooking time. (You want the olive oil flavour to be quite strong in this dish and using 'pure' is sure to pack in a great punch). what other beans can be substituted ?